Flanking the Southeast Piazza are two small, enclosed terraces that could be entered from the house through the piazza, the adjoining Cabinet or Bookroom, or from the outside via small sets of stairs. Though Jefferson never wrote a description of their function, it is likely these porches (which Jefferson sometimes called "porticles") were used as extensions of the indoor living spaces. 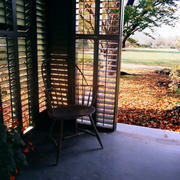 The louvered blinds could be moved to adjust the amount of light, providing shade, air, and a modest amount of privacy. Dimensions 8' - 7" x 7' - 1 3/4"